The Bold and the Beautiful (B&B) spoilers tease that some sabotage could be afoot. B&B fans will remember Bill’s (Don Diamont) favorite tech whiz, Ken (Danny Woodburn). He showed up last October to help Bill do some hacking and get rid of Liam’s (Scott Clifton) evidence against him. It turns out Ken’s headed back to the CBS soap, but he may be working for the enemy this time. Ingo Rademacher (Thorne) recently shared an intriguing pic on Instagram. He wanted to let everyone know about the mischief that’s in store. Rademacher’s photo featured himself as well as Woodburn and Heather Tom (Katie). “Got some fun stuff coming up with @dannywoodburn,” Rademacher said. “Awesome work today on @boldandbeautifulcbs buddy, was great working with you.” The actors were all smiles on set and their characters could soon be smiling, too. It all depends on how well Ken’s next round of hacking goes! We can gather some interesting clues from the picture and the people involved. For starters, it lets us know that Thorne and Katie will be spending more time together. The Young and the Restless spoilers say a breakup’s brewing for Katie and Wyatt, so she won’t stay single for long. Thorne will undoubtedly succeed in sweeping Katie off her feet. However, trouble’s obviously in the works. You don’t call a tech expert like Ken unless it’s a dire situation. There are a couple options to consider. Since Steffy’s (Jacqueline MacInnes Wood) rejecting Bill, you can bet that Ridge (Thorsten Kaye) will gloat. Bill may decide he wants to destroy Forrester Creations as part of his revenge. Thorne and Katie may be looking for a way to stop Bill’s threat to the company. Then again, this could be about helping Katie alone. Although Katie and Wyatt are gearing up for a split, Bill may still pull a custody shocker. If Thorne gets on Bill’s bad side, things could easily get ugly. Bill may fight Katie for Will (Zane Achor), so she could need major dirt to keep her son. Bill’s got plenty of money to bribe judges with. It’s clear that Katie would have to fight fire with fire, so Ken could pitch in. He might hack Spencer Publications to get new leverage or maybe even recover those incriminating recordings. Whatever the case, The Bold and the Beautiful spoilers say the excitement’s about to rev up! 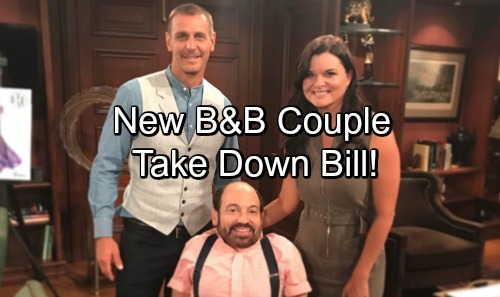 We’ll give you updates as other B&B news comes in. Stay tuned to the CBS soap and don’t forget to check CDL often for the latest Bold and the Beautiful spoilers, updates, and news. Got some fun stuff coming up with @dannywoodburn Awesome work today on @boldandbeautifulcbs buddy, was great working with you.